Tirau is a very cute little town, right in the middle of stunning Hobbit country near the set of the Lord of the Rings movies. 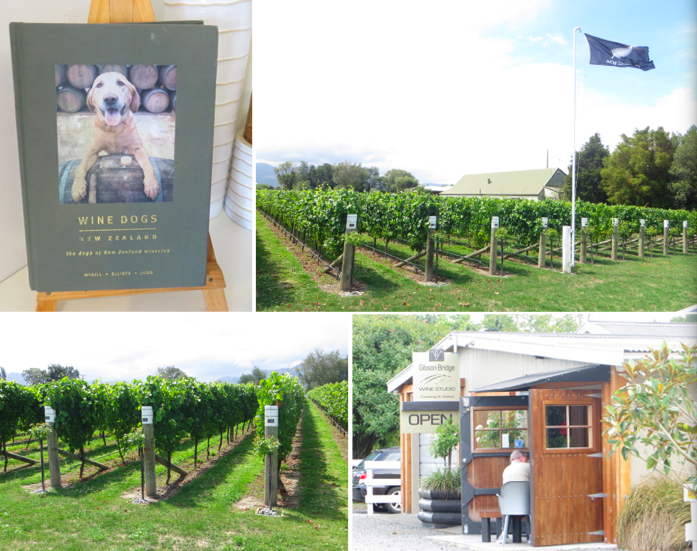 But Tirau isn’t just the town you pass through on your way to the main attractions as it may seem on the map. For us it was the main attraction. 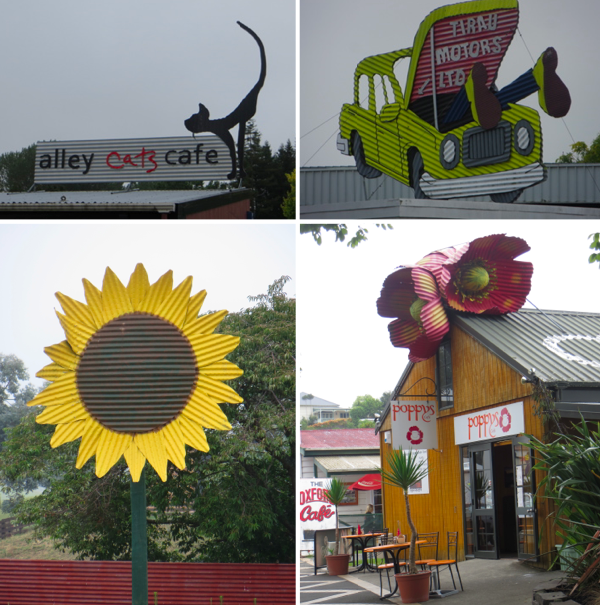 Tirau you see, has gone corrugated-iron art crazy. The whole town is covered in it. 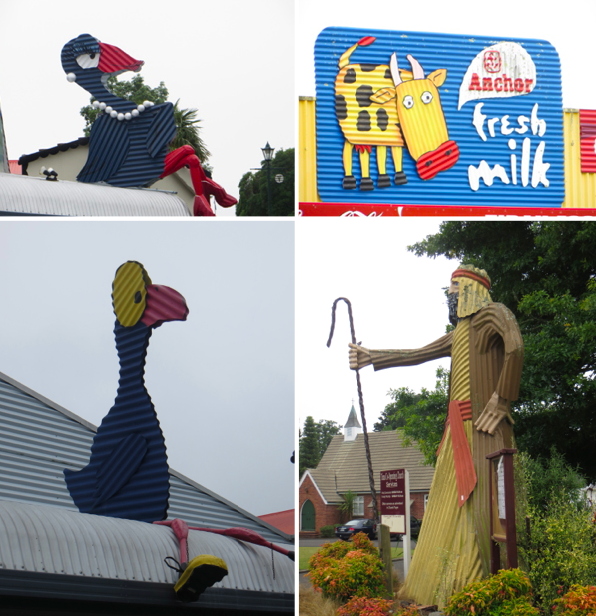 Most businesses use it for their signs and several of the buildings are even made entirely of it. They have shaped and coloured it into all sorts of fun things. 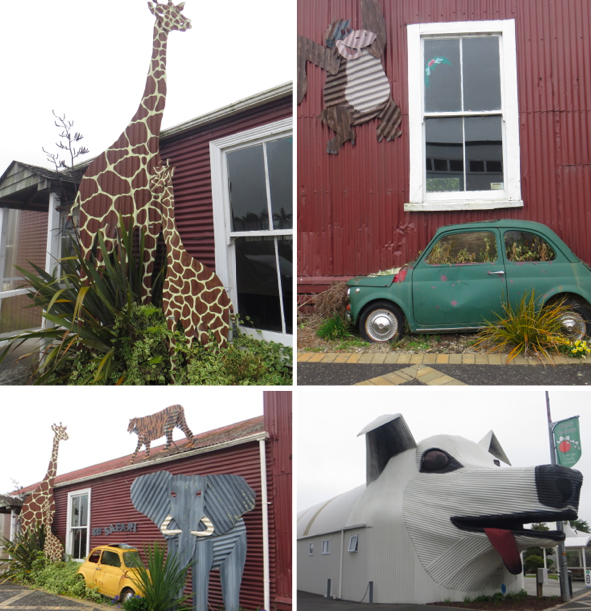 For example, the tourism office is in a building that looks like a giant dog, which is sitting right next to a giant sheep building. 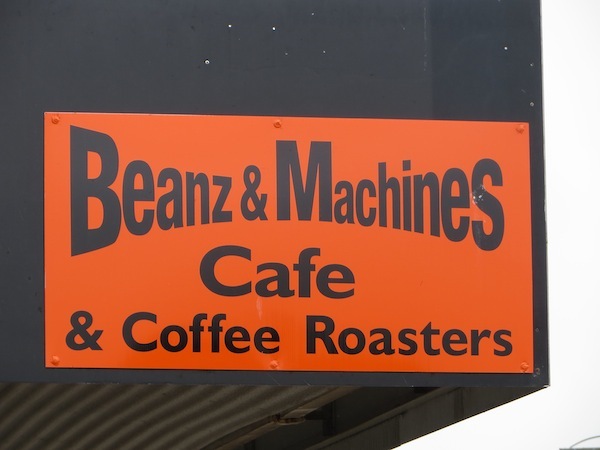 We walked all the way up the hill and ended up at Beanz & Machines Café so that Rich could get himself a really good coffee. 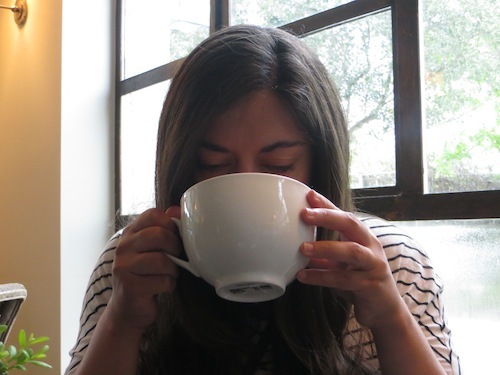 I had no expectations for the hot chocolate and again got confirmation that some of the worst hot chocolates come from the best coffee shops. I only had a few sips because it was so incredibly sweet. But the barista was the real deal. Not only did he have a fantastic Kiwi accent but he made some really beautiful designs on both Rich’s coffee and my hot chocolate. Rotorua is a crazy place. It has a lot going for it. 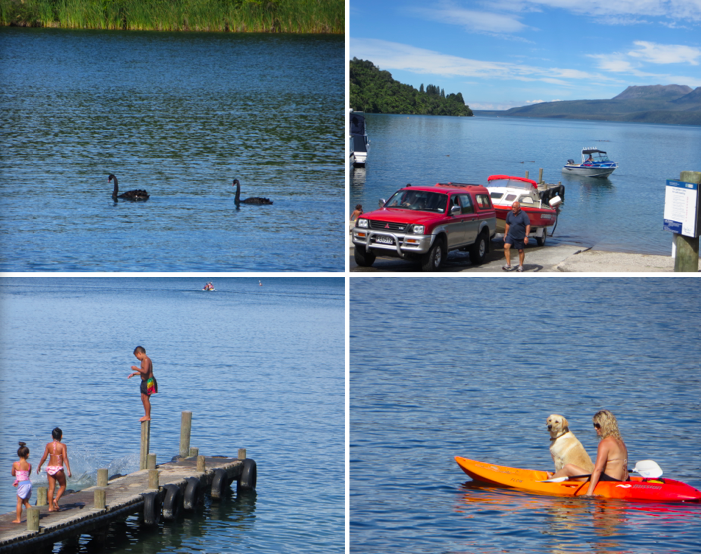 There are 16 beautiful lakes in the area perfect for swimming, fishing and boating. 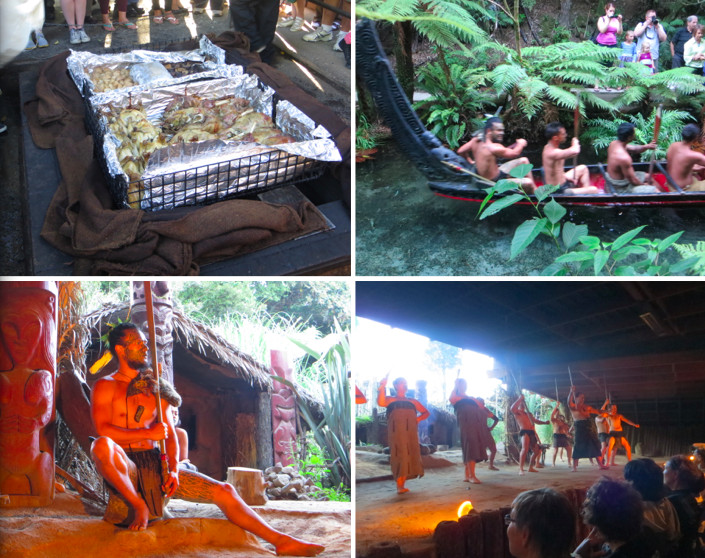 35% of the population are of Mauri descent, meaning there are plenty of opportunities to learn more about the Maori culture (we chose to do the Mitai Cultural Performance which surprisingly didn’t feel that touristy at all, was incredibly educational and a really fantastic evening). 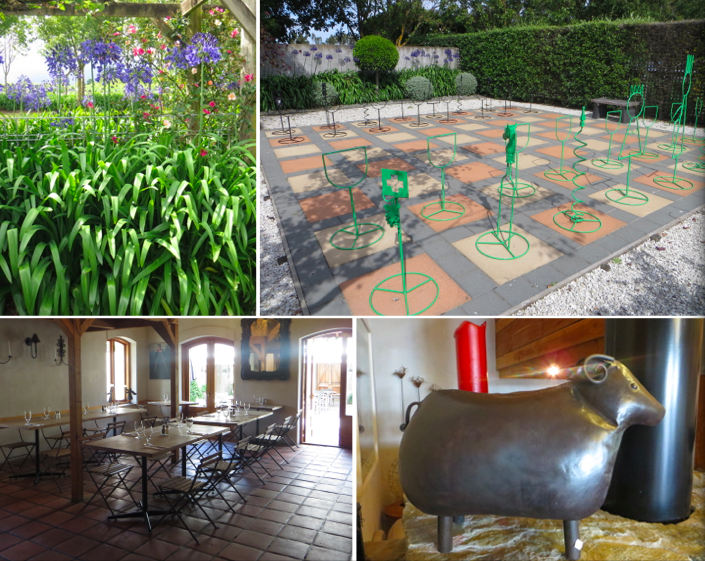 You really couldn’t get bored here. 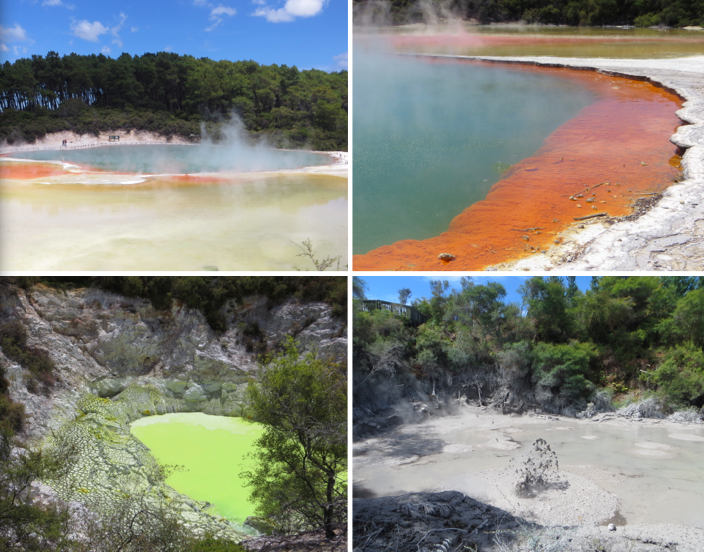 But the main thing about Rotorua is that it’s a geothermal paradise. When you first drive into town you can’t help but notice the strong smell of sulphur. Driving through the center of town you will see a little city park, normal right? Except this one is sitting on active geothermal land meaning there is boiling mud, hot pools where you can soak your feet and others that you can’t go near because they go up to 100 degrees Celsius. 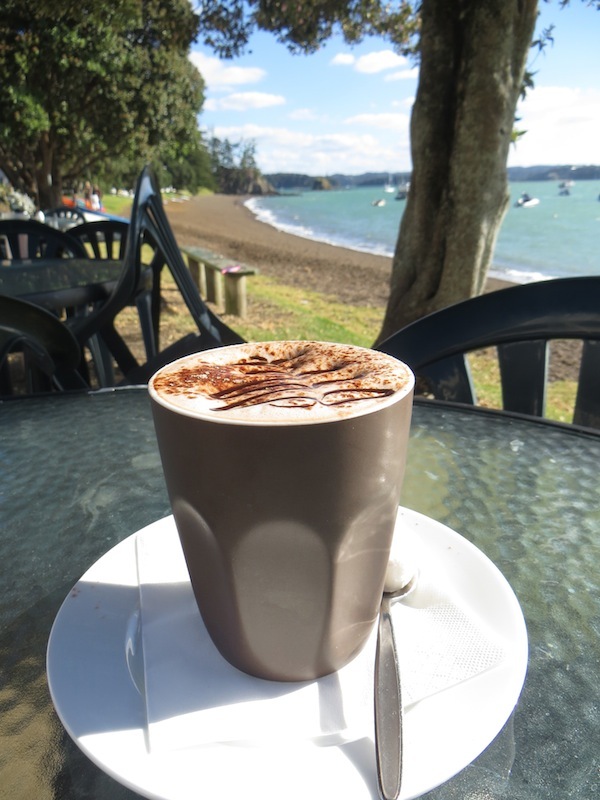 There are thermal springs and mud pools where you can pay to sit and relax for the day or you can choose to take a hike around one of the many thermal parks in the area (we choose Waitapu and loved it). 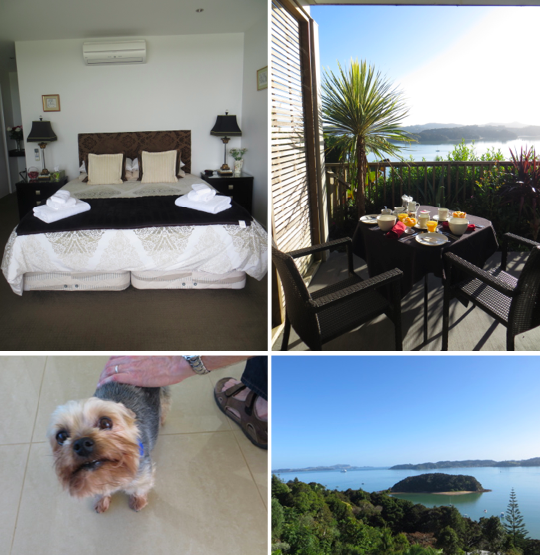 Sometime in between all of this we did a short scenic drive towards Lake Tarawera. At one of the car parks for this lake is The Landing Café where they sell food, drinks and ice cream. 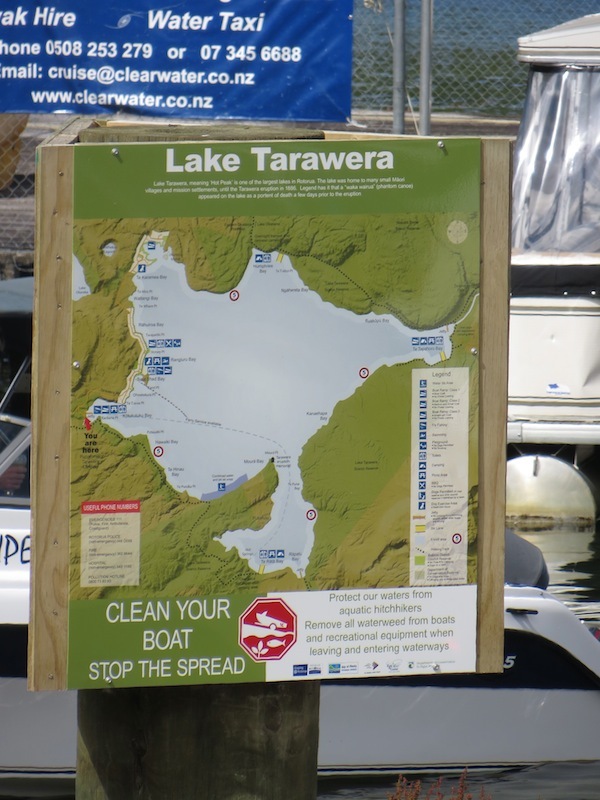 If you take one of the tables outside you can watch as a steady stream of boats arrive at the dock to either be put into the water or taken out of the water. 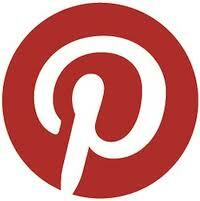 Its amazing how time passes while you watch this activity. There are drivers who know exactly what they are doing and others that seem to have no clue and take 4, 5 even 6 tries to back the boat into the water – quite entertaining! 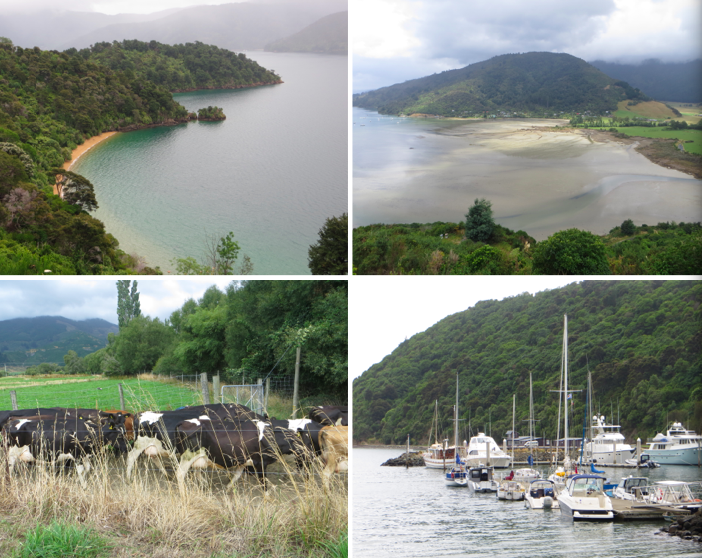 If you get bored of watching them of course you have the scenery which, in true New Zealand style, is stunning. There is a volcano in the background, the bright blue waters of the lake and the electric green tree covered hills surrounding it. It was too hot today for a hot chocolate so I tried, for the first time ever I believe, an iced chocolate. 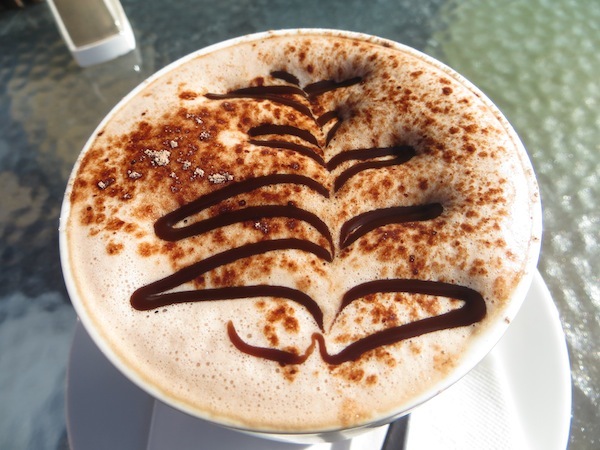 I didn’t think you would mind since it is really the similar idea to a hot chocolate, just one you have left to cool down. 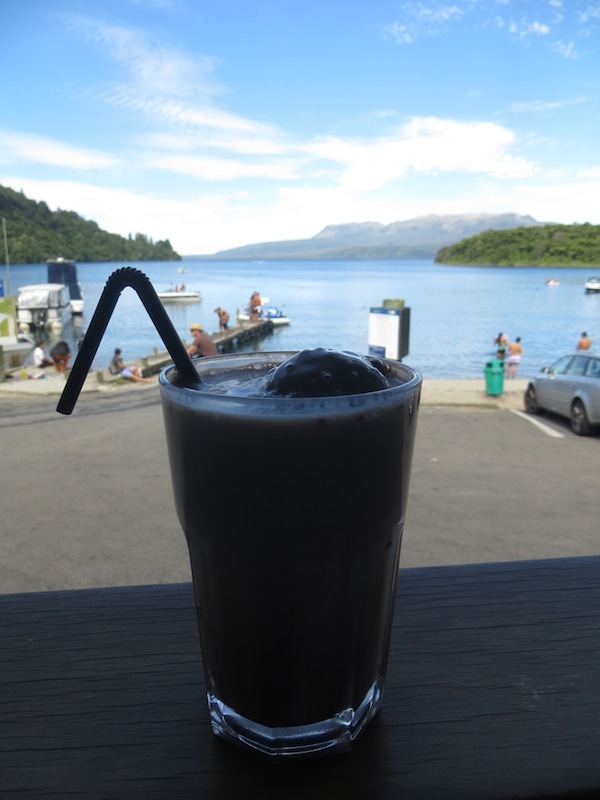 I realized after I got mine though that it is a little different because this iced chocolate is made up of chocolate, milk and icecream, but it was great for an afternoon on the beach. 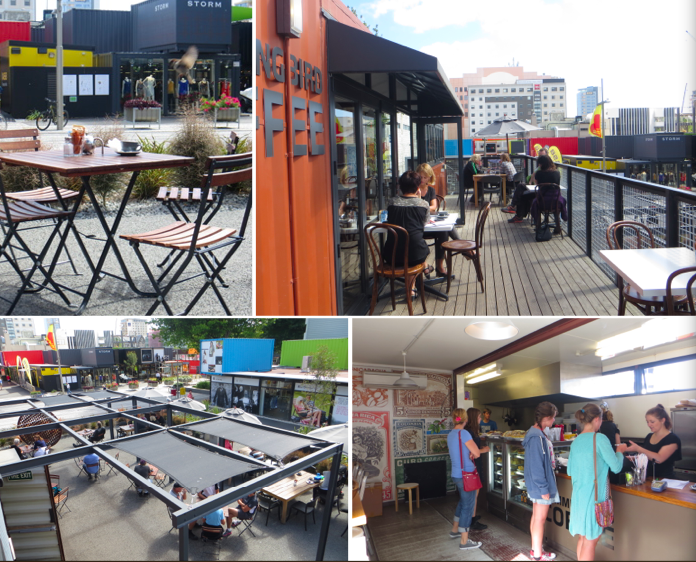 If you are looking for a spot to grab a bite or a drink, Cuba Street is the place to go in Wellington. The street is packed for blocks and blocks with a whole range of interesting looking spots. 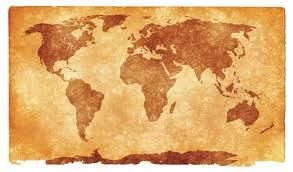 There are restaurants serving food from every country you can think of, including India, Malaysia, Turkey and Mexico. 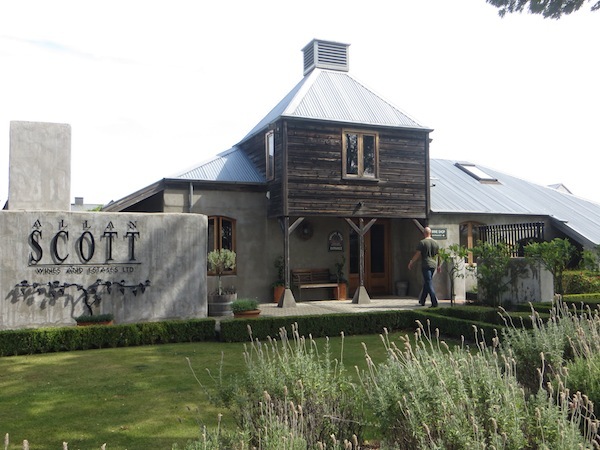 You have the local restaurants serving fusion dishes including one restaurant, Logan Brown, which is considered one of the best restaurants in New Zealand. 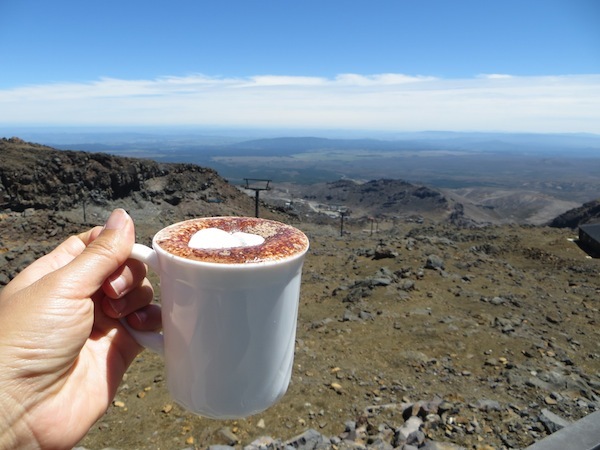 You have, of course, a pretty large choice of spots to have coffee too, since New Zealand does seem to be the coffee lovers capital of the world oddly enough. So the other morning when we were looking for a spot to grab a quick breakfast we had plenty of choices. Olive jumped out at us and welcomed us in. 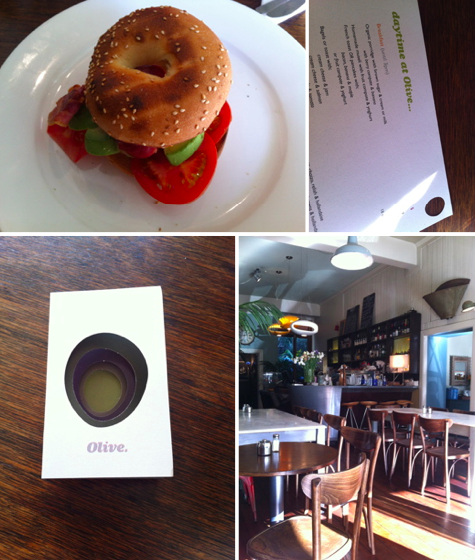 I really liked Olive. 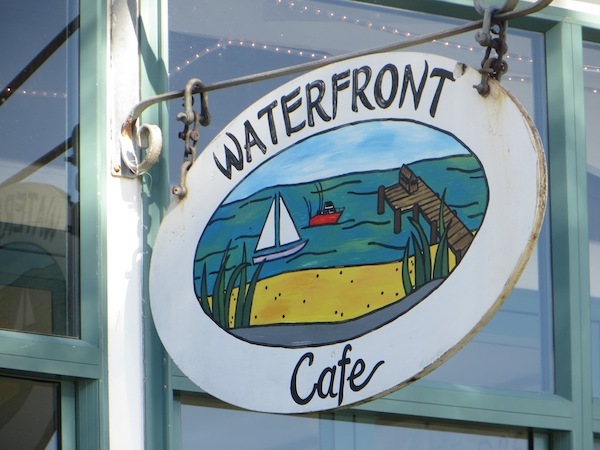 First it has a fantastic name, isn’t that just a great name for a coffee, breakfast, lunch, restaurant and overall just really fun place to be? I think so! 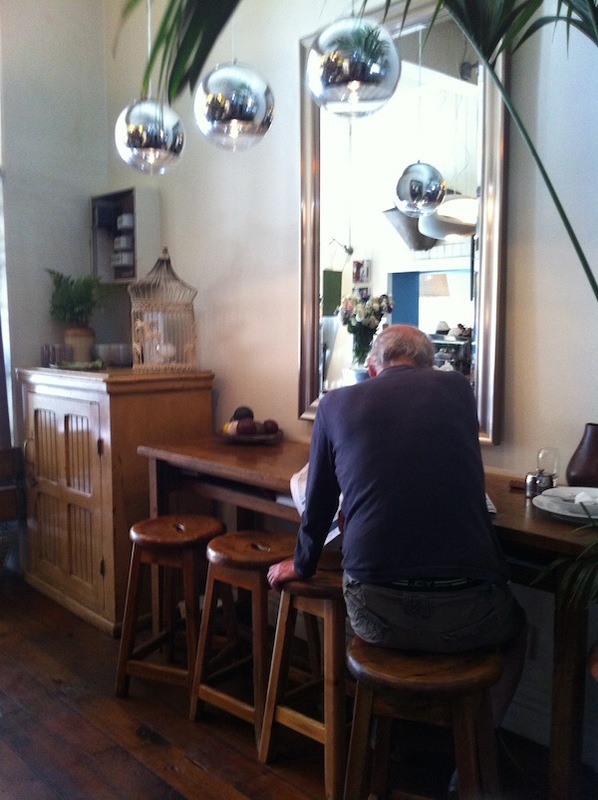 Inside the place is bright and airy with wooden tables and interesting art pieces on the wall. 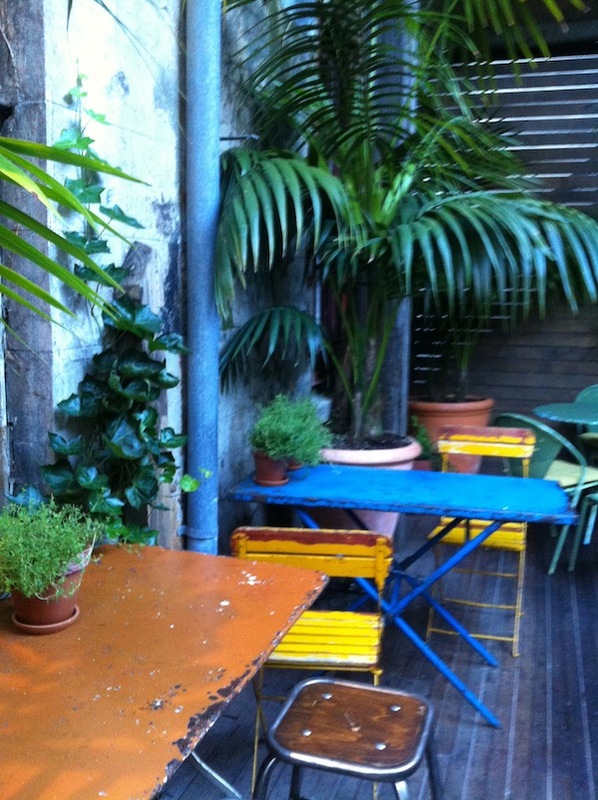 My favorite part though was the terrace outside at the back which feels like an overgrown jungle with great colorful tables and chairs scattered throughout. I ordered a hot chocolate and a breakfast bagel and was pretty happy with both. 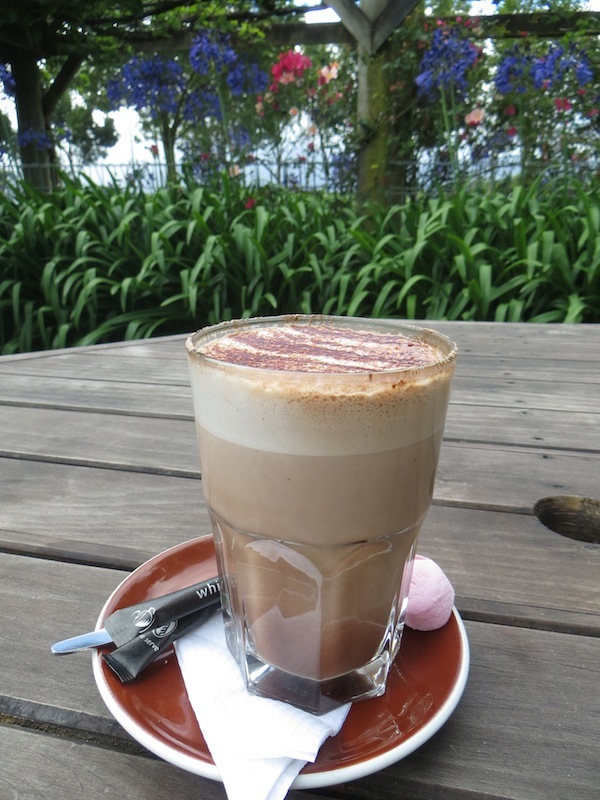 My hot chocolate came in a tall glass which seems to be the norm in New Zealand. Pretty much all my hot chocolates came in glasses and were all too hot to hold until pretty much the point when the hot chocolate had turned lukewarm. It looked really nice and didn’t taste bad. It tasted like sweet warm milk which made me happy this particular morning. For a country that is so into their coffees I wish they put a little bit more effort into their hot chocolates, but I did enjoy this one. We were in a bit of a rush this morning as there was a 2.5 hour walking tour that leaves from the tourism office at 10am that we wanted to take. We got there just on time, and were really impressed with it (Walk Wellington). 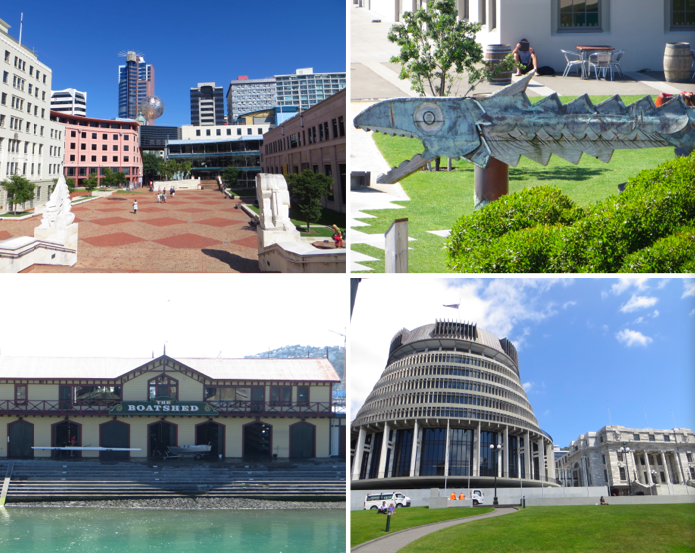 After the walking tour finished, we continued on our own, walking along the harbor, up the hill to the Botanical Gardens and paid a visit at the end of the day to the “Te papa” museum which you will like even if you don’t like museums. “The Store” is one of my favourite little spots in the whole world. To start with, The Store is located really in the middle of nowhere. 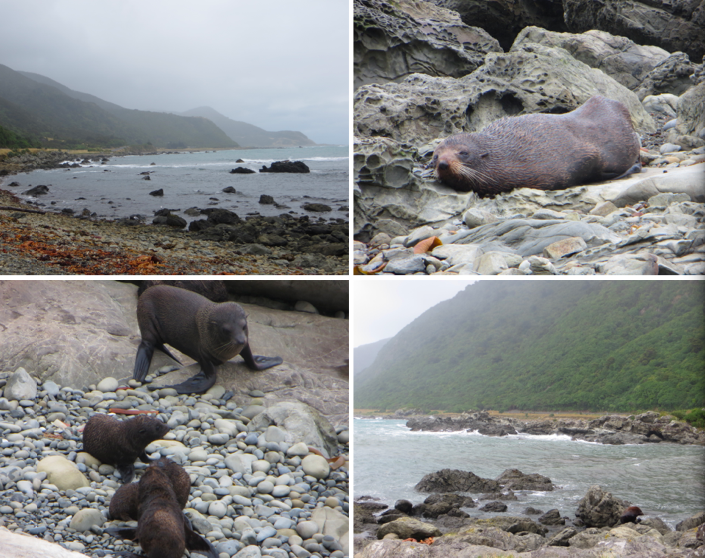 If you take the road from Blenheim to Kaikoura on the East Coast, it is exactly in the middle. Before it there is nothing and after it there is nothing. Nothing that is except lush hills covered with beautiful trees that come all the way down to the road on the right side and a stunning coast line with rough waves and rocks along the shores on the left. From inside you enjoy this same view and can watch the waves hitting the sandy beach just outside the back terrace. It is a present, a treat and completely unexpected at this particular spot. The second thing I love about The Store is the design. It looks like it might have been an old post office, at least part of it. 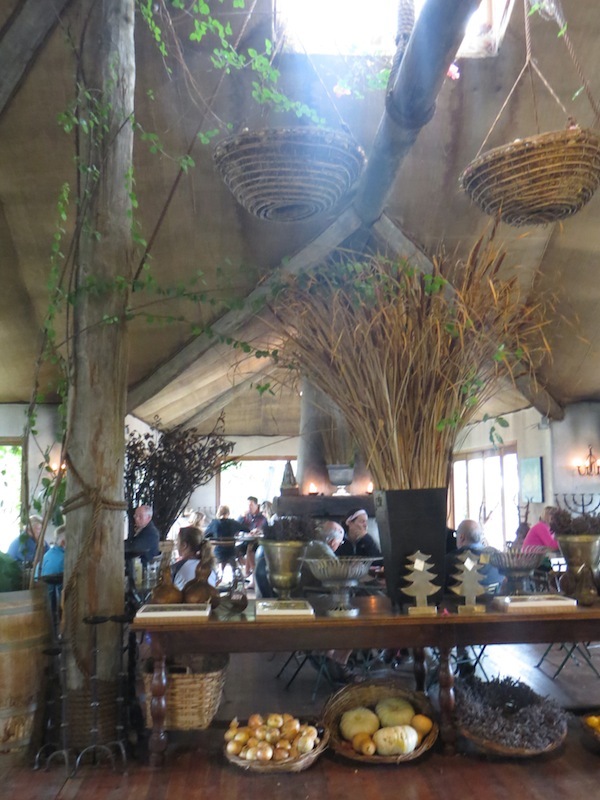 The main eating area has been designed to look like a traditional cob , but also has the look of a giant yurt or tent from the inside. The main counter has two large displays, one full of sandwiches and quiches and the other of tasty looking sweets. A giant blackboard on one side lists the specials for the day. 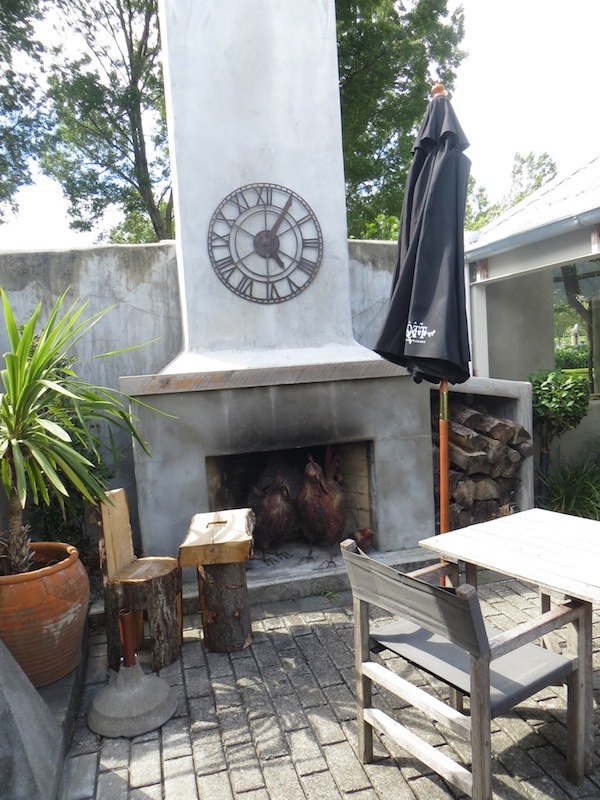 There are several tables both inside and out but because of the chilly breeze we opt for one inside. 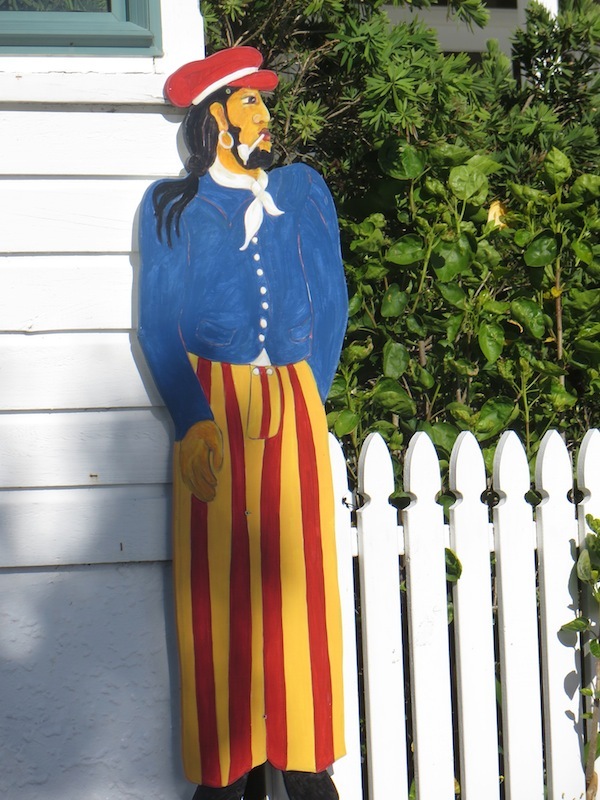 We are surrounded by curiosities, many of which are for sale. 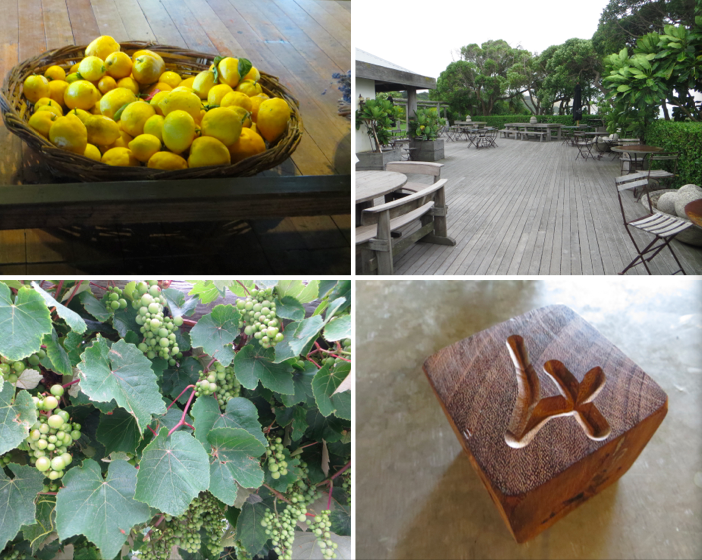 There are a series of large baskets on the floor near our table, one filled with lemons, one with lavender. 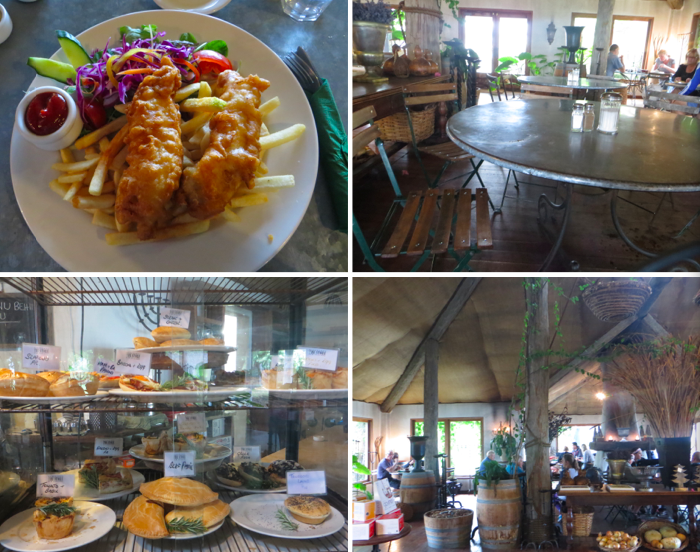 We ordered two fish and chip plates which were delicious and of course I ordered a hot chocolate. The hot chocolate was beautifully presented but there wasn’t very much of it. 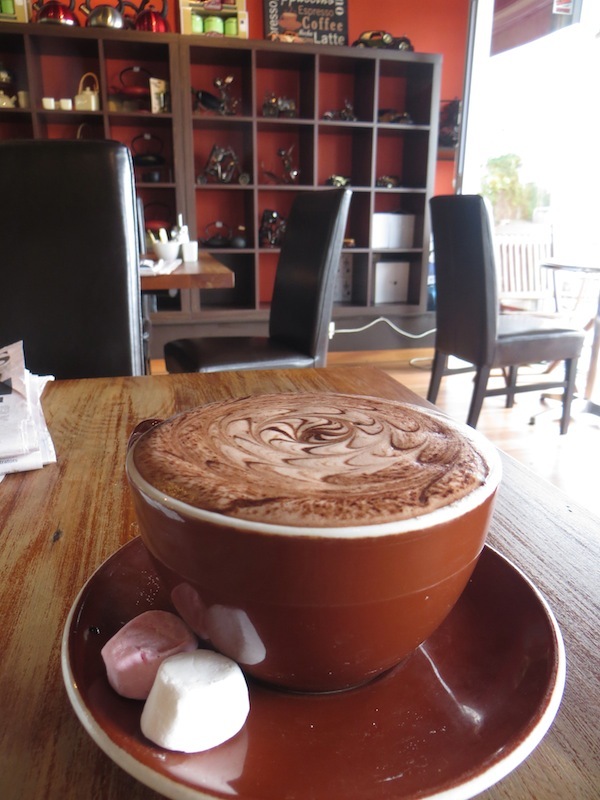 Like most Kiwi hot chocolates there is a pretty thick later of foamy milk on the top of the hot chocolate. In this case they broke the record for the trip, a full half of the cup was milk foam which only left room for a taste of hot chocolate underneath unfortunately. The little hot chocolate I got I enjoyed. It tasted as a nice hot chocolate should, like chocolate but not too sweet. Once you leave, full and satisfied, the drive along the coast will continue to impress. If you can take your eyes off the road or stop along it, there are thousands and thousands of seals, from big male seals to mothers nursing their young. 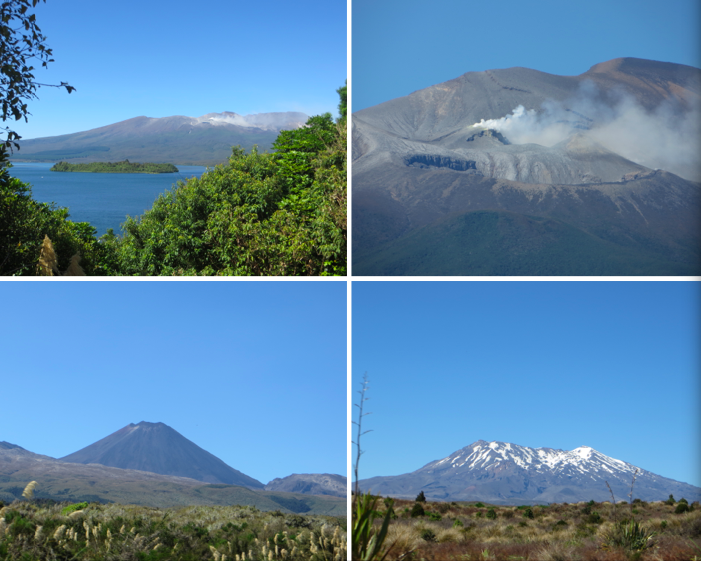 While driving down the North Island of New Zealand, I was really keen to visit Tongariro National Park. Unfortunately we didn’t have time this trip to go hiking across it, apparently one of the most beautiful hikes in the world. Turns out it didn’t matter anyways, because most of the tracks were closed since one of the nearby volcanos had erupted only a few weeks ago, and it was still smoking pretty strongly. We took the road up to nearby Mt. 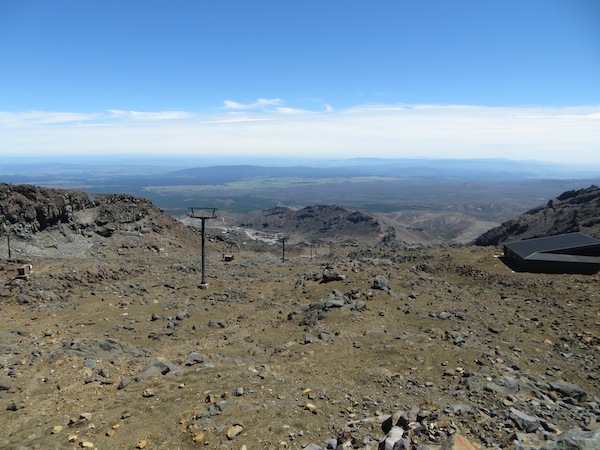 Ruapehu which is an active ski resort in the winter. 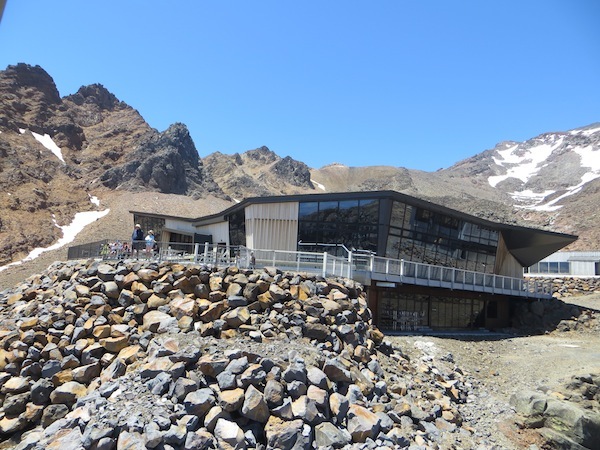 Of course, being summer, there was only snow right at the top and the houses and ski chalets were all nestled amongst the black volcanic rocks making it look a bit like a movie set for a star wars or other intergalactic movie. At the end of the road there was a car park and a little coffee shop and we went in thinking we would get a hot chocolate there. 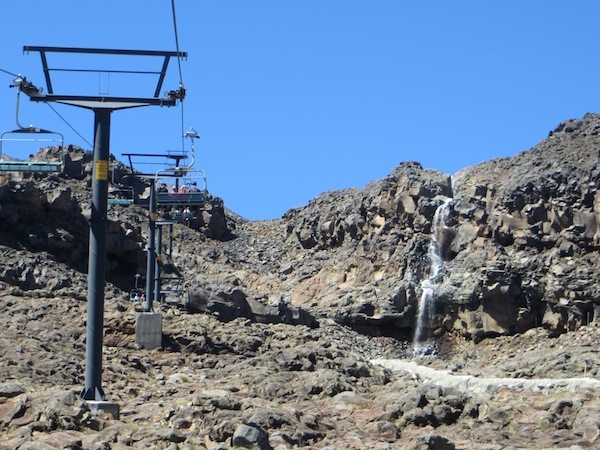 We quickly realized that the ski lifts that bring skiers up the mountain in the winter also operate all summer long. 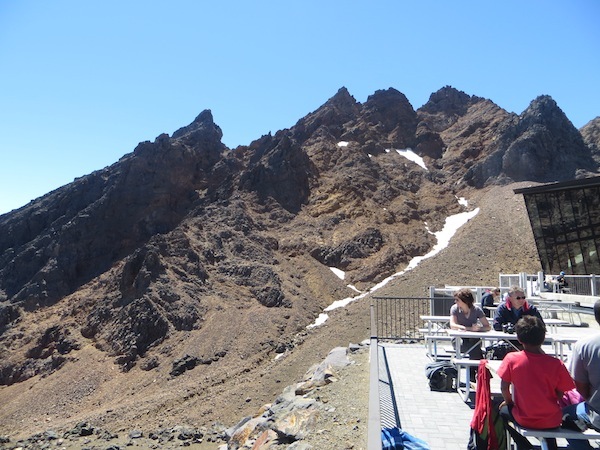 Not only that, but the highest café in New Zealand is almost at the top of the mountain (at 2020m). So we paid the 30 dollars each and took the two chair lifts to the top. 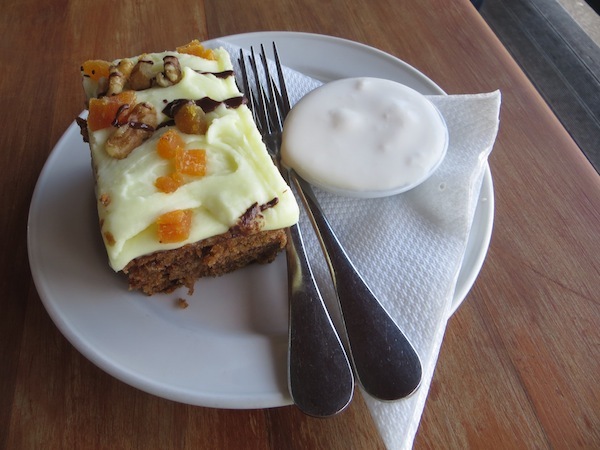 The ski lodge at the top of the chair lifts is big enough to welcome the winter skiers but a small part of it is open all year around including a little coffee shop with sandwiches, drinks and treats and of course an incredible outdoor terrace . We ordered lunch and drinks and sat on the terrace outside. From here we had the most incredible view. We could see the other mountains in this area, which is all part of a World Natural Heritage Site. 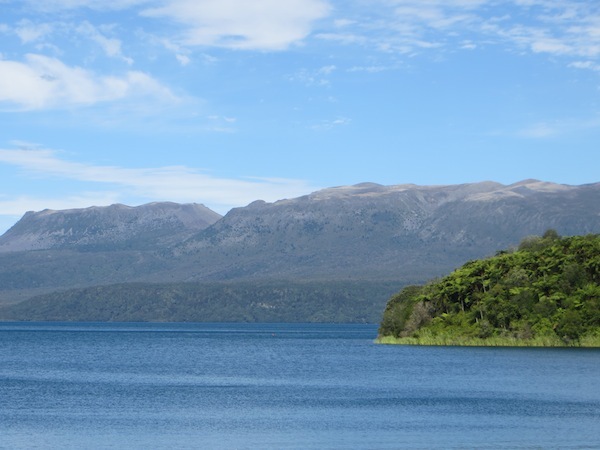 We watched the smoke coming out of the nearby active volcano, and could even see as far as Lake Taupo and beyond. My hot chocolate was exactly what you’d expect after a day of skiing on the mountains. It was hot and sweet and kind of perfect for a ski resort, even in the middle of summer. February 2011 the city of Christchurch was hit by a big earthquake. The magnitude 6.3 earthquake, and all of the aftershocks that followed it, including a second 7.1 magnitude earthquake 6 months later, had a huge impact on the city leaving hundreds without homes. It also had a significant impact on the central part of the city which is immediately obvious as you drive around. Virtually none of it is left. 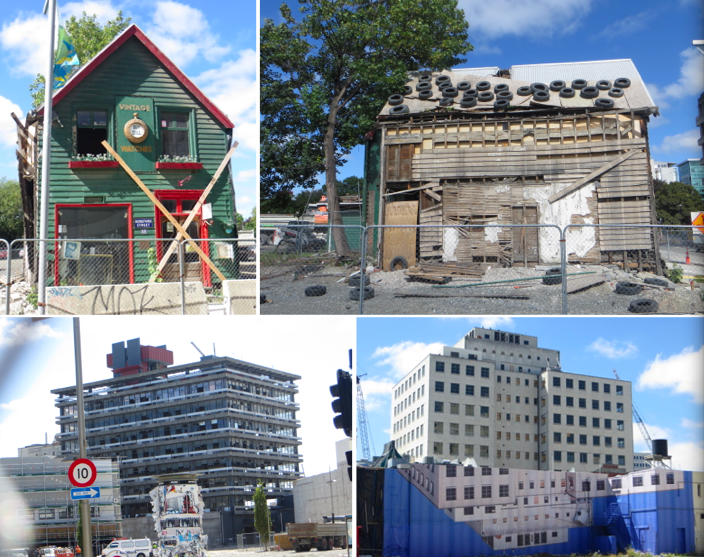 There is a large part, called the red zone, where all the buildings, pretty much every single one, has been or is in the process of being flattened including the beautiful Christchurch cathedral. But in the middle of all this is a little gem, called ReStart. The ReStart mall has been set up on Cashel Mall and is very easy to get to and to find parking for. 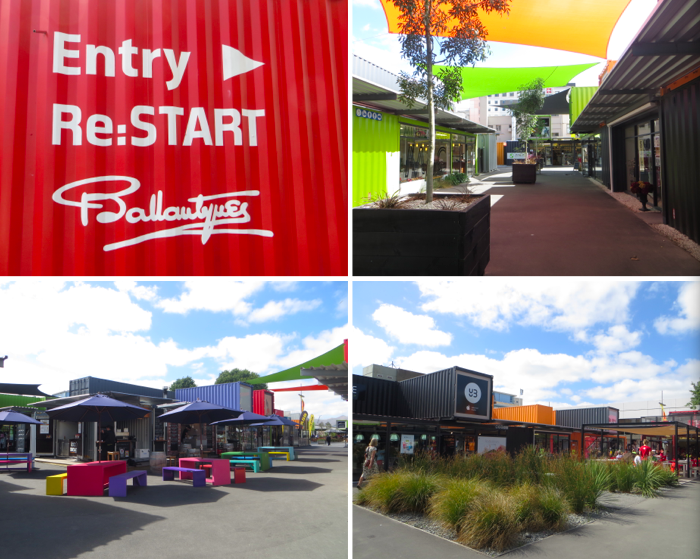 The whole area has been set up with shipping containers which have been painted bright colours, adapted to have glass sides and filled with a range of exciting stores, ranging from stores that used to be in the area before their buildings were demolished to New Zealand designers, food shops etc. It is really incredible what they have done and the hundreds of other people walking around the area probably all are thinking the same thing. It is a fun and dynamic area and although it was meant to be a temporary installment I hope that they keep it here permanently. 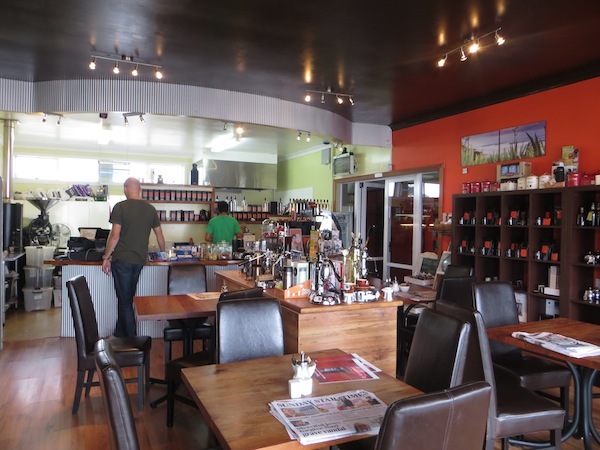 On one side of the Mall is Humminbird Café. 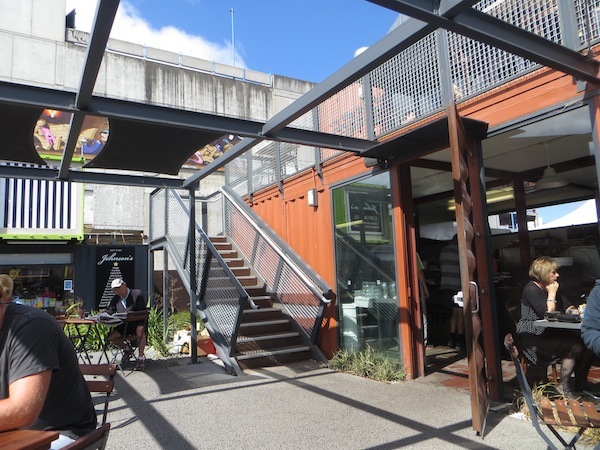 This is made up of a few large shipping containers side by side and on top of each other making it a two story shop. From the top you have a view of the whole ReStart area and the surrounding buildings that have yet to be demolished. The tables on the terrace were almost all full, and we were lucky to find one. 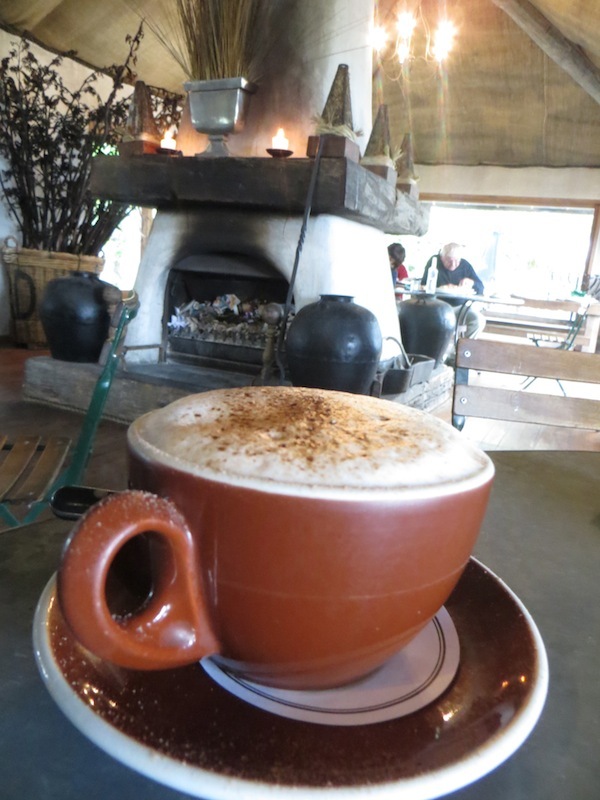 Of course I had to try their hot chocolate, and I loved it. It came in a gorgeous grey blue mug. 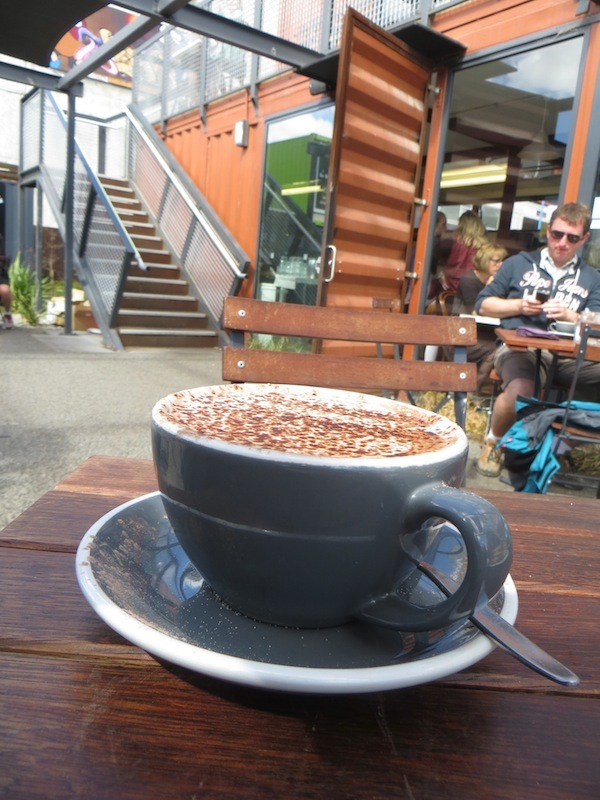 It was just a nice hot chocolate, nothing too extraordinary but exactly what I wanted this morning and my favourite probably so far in New Zealand. 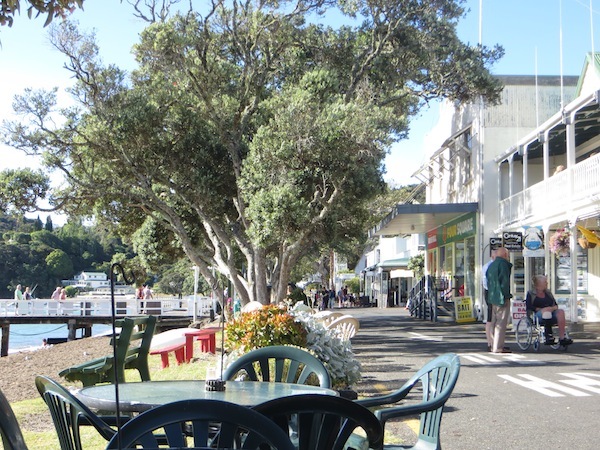 There was jazz playing in the background, the staff were very friendly and smiley, and from our little table not only did we have the beautiful sun warming us up but also a view of all the other people enjoying ReStart and all that it has to offer for locals and tourists alike. 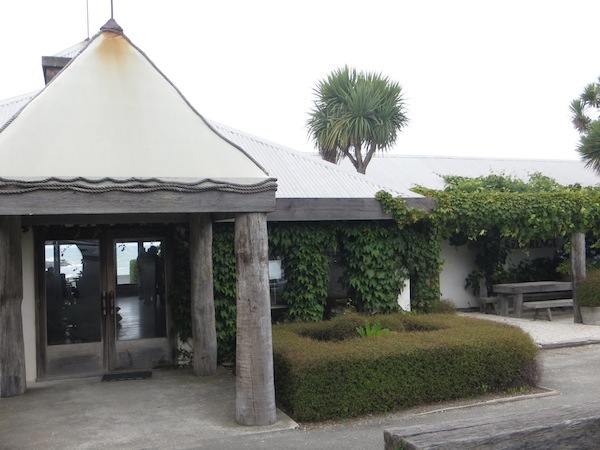 We stayed a few nights in Pahia at a great B&B called Tarlton’s Lodge (highly recommended) because we thought that Pahia was the place to be to explore the Northlands. We soon realized that Pahia itself is really not too exciting, what you have to do is either leave Pahia or take the ferry across the water to Russell. Russell is great. It is everything that Pahia is not. It is quiet and charming and quaint. The ferry drops you off on the main street which is pretty much only for pedestrians with the beach on one side and a range of little stores and old houses on the other. 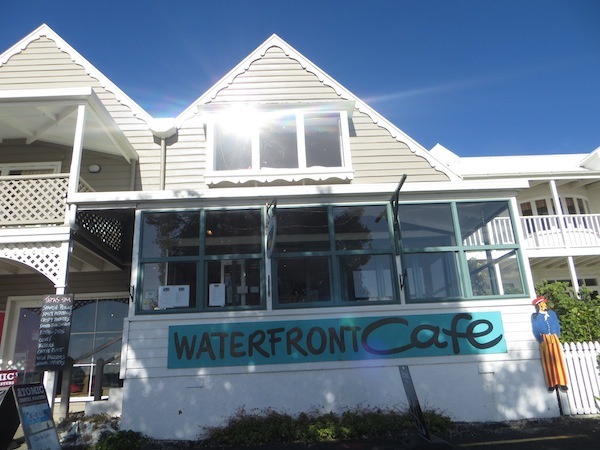 We choose the Waterfront Café to have our drink and watch the sunset over the Bay of Islands. From here there was a cool steady breeze which swayed the big old trees lined up all along the beach but the sun kept us warm enough. We watched as the little ferries came and dropped off passengers visiting from Pahia and pick up some going back. My hot chocolate did a good job of warming me up but was pretty sweet. 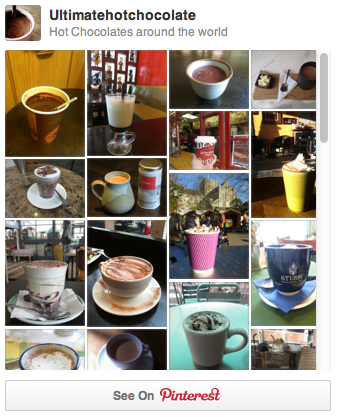 This is a trend I have been seeing with all my hot chocolates in New Zealand. They are all very sweet but even more common are the two little marshmellows that always seem to accompany a hot chocolate. One is always pink and the other white, and I now refer to them as sugar bombs because they are by far the sweetest thing I have even eaten in my life. 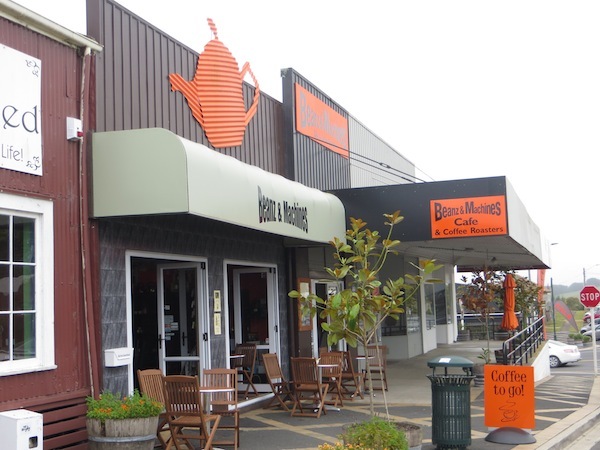 Virtually every café we stopped at in New Zealand gave me the same ones so I am guessing this is a national brand. Even Rich who is a big sweet tooth wouldn’t go near them! Even with the sugar bombs I enjoyed the hot chocolate and honestly a hot chocolate on the beach at sunset is really a fantastic way to end a good day. After having our drink we walked up and down the main street until it was late enough to go for dinner. 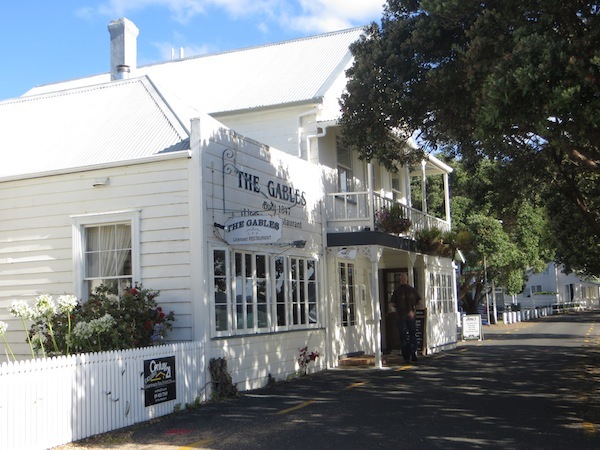 We ended up at The Gables right next door and had their daily special – squid ink pasta with seafood, a bit of a change from nights and nights of incredibly taste fish or lamb.